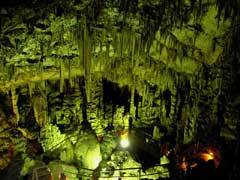 According to one of the legends, the Ideon Cave was the birthplace of Zeus. In the myth, Rhea brought the infant Zeus to the Ideon cave to protect him from his father, Kronos, who would have swallowed him alive, as he had previously done with his brothers and sisters. Here he was nursed by the goat nymph, Amalthia. He was protected by the Kuretes (5 Cretans) who danced and clashed their weapons to cover the cries of the baby Zeus.